In August 2012, the worst flooding in years hit Myanmar, submerging 240,000 ha of rice fields and making about 85,000 people flee from their homes. Flooding has been a yearly occurrence in Myanmar and has robbed farmers of their income and food sustenance. There are two types of flooded areas in Myanmar: the submergence areas (caused by flash floods from rivers) and the deepwater areas (caused by stagnant water resulting from heavy rain). Field visit to CURE site with Dr. Abdelbagi Ismail. On rice production. Myanmar thrives predominantly on rice production, which is the core of the country’s agricultural economy. Sixty-eight percent of favorable area and 32% of unfavorable area are planted to rice. Of these, 14% is flood-prone: 9% submergence areas and 5% stagnant areas. These flood-prone areas are situated in 12 states and regions. Figure 1 shows the location and area in hectares. The largest flood-prone areas are in regions Bago and Ayeyarwaddy, which occupy 19.5% and 18.7% of the total rice-growing area, respectively. Farmers’ practice. Farmers continue to grow traditional varieties, although these have low yields, late maturity, high photosensitivity, and poor grain quality. The reason is their good flood tolerance, a trait that some modern high-yielding varieties do not have. In some years, farmers do not profit from their rice fields. When floods occur and damage their rice crop, replanting cost a lot. Sometimes replanting is impossible. There is thus a need to develop flood-tolerant rice varieties that can survive in submerged and long-/short-term deep water areas. Collaboration. IRRI-CURE’s Working Group on Submergence and Myanmar’s Department of Agricultural Research (DAR) started collaboration to develop flood-tolerant rice varieties in 2006-07. 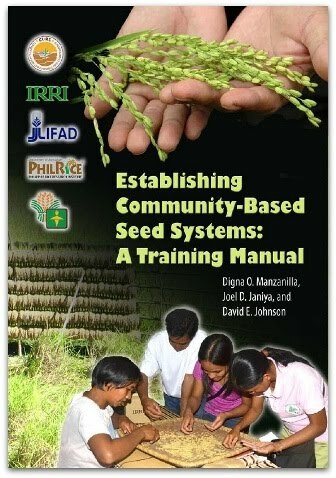 This was followed by another joint research by IRRI-Japan and the DAR’s Rice Division in 2008-09. The latter was designated the key institution and Ayeyarwaddy Region as satellite site. Rice lines. 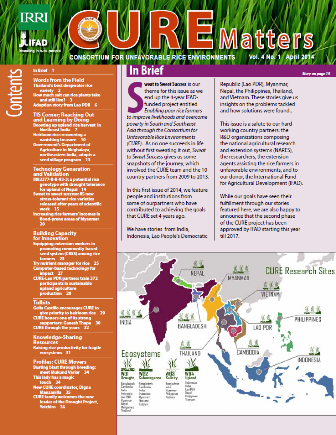 In 2007, IRRI developed Sub1 lines, including Swarna Sub1, BR11-Sub1, TDK1-Sub1, and IR49830-7-1-2-3. These rice lines were evaluated along with existing local cultivars (Sitpwa, Tharpaung Meegauk, and Meegauk Dume). Replicated trials were done at Pathein and Ngwesaung townships. At that time, flooding episodes occurred thrice during the vegetative stage; duration ranged from 5 to 21 days. Swarna-Sub1 and local variety Meegauk gave acceptable yields, 3.5 -4.5 t/ha in 2007. Three best performers. In 2008, 13 lines including five Sub1 lines and three local varieties were tested in Pathein and Ngwesaung. Four rice lines performed very well: Swarna-Sub1, BR11-Sub1, TDK1-Sub1, and IR49830-7-1-2-3. A year later, these same promising Sub1 lines were assessed again through PVS. Research-managed PVS trials were done in Pathein, Ngwesaung, and Kaunggyidaunt. Results of the PVS-research-managed trials showed Swarna-Sub1, BR11-Sub1, and TDK1-Sub1 to be the best performers. On-farm trials. 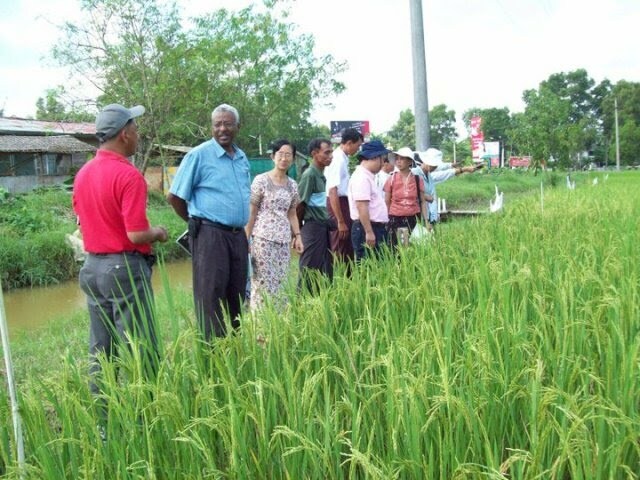 From 2007 to 2011, on-station and on-farm demonstration trials were conducted in the townships of Yezin, Ngwesaung, Kyaungkone, Pathein, and Einmae. Other trials in the same years were done in the Myaungmya research farm, Mandalay region, Yangon region, Bago (east and west) region, Rakhine, Kayin, Thanintharyi, and Mon states. Yield results. From these on-farm trials, Swarna-Sub1 bested all other rice lines with a yield of 3.5-5.0 t/ha. The local check variety yielded only 1.5-3.0 t/ha in Pathein from 2007 to 2011. Although the test locations Pathein and Ngwesaung were severely flooded in 2007 and 2008, Swarna-Sub1 yield was better than that of local check Meegauk (15.63%-64.32%). Likewise, under normal condition, Swarna-Sub1 also gave higher yield (4.5-5.5 t ha-1) in Yezin, Myaungmya, Pathein, and Einmae. It consistently showed good yields in both flooded and normal conditions, affirming its submergence-tolerance trait. The variety survived 10-to-14-day flooding duration. It has the same grain size as that of farmers’ popular variety, Manawthukha. It has high milling recovery, dark green leaves, lodging resistance, and good erect plant type. The Myanmar NSC approved the registration of Swarna-Sub1 as a new submergence rice on March 13, 2013. It is the first submergence-tolerant rice variety in Myanmar. The NSC Committee also approved Yemyokekhan 1 as Swarna-Sub1’s commercial name. New promising varieties. BR11-Sub1 and CR1009-Sub1 are the next promising submergence varieties. The 2013 results of the wet-season on-farm trials of these varieties in flash-flood submergence areas of Bago, Taninthari, Rakhine, Kayin, and Mon states showed that they have tolerance for flooding, more grains per panicle, more seed weight, and same grain type as local popular variety Pawsanhmwe. Increasing farmers’ income. News about the good qualities of Swarna-Sub1 spread like fire from farmer to farmer. This, along with seed distribution, created a market demand for Swarna-Sub1 seeds in Ayeyarwaddy and Bago regions. Farmers from flash-flooded areas now grow Sub1 varieties to cope with the higher market demand. The need for Swarna-Sub1 seeds is high in areas hit by cyclone Nargis (Ayeyarwaddy region) and typhoon Giyi (Rakhine State). In particular, the demand for Swarna-Sub1 is rising in Mon State. Myanmar’s state government has encouraged the growing of stress-tolerant rice varieties, including Swarna-Sub1. Traders’ preference. Consumers, growers, brokers, and traders like Swarna-Sub1 for its grain shape, which is similar to that of Manawthukha, a popular variety. It was popular not only because of submergence tolerance but market preference as well. Some seed growers cultivate Swarna-Sub1in favorable land due to high seed demand. Traders also sell Swarna-Sub1 seeds to farmers from flood-prone areas. This milestone of the IRRI-CURE programshowcases the positive impact of research collaboration between IRRI and Myanmar. Other concerns. In addition to flooding, other concerns get the attention of both researchers and farmers. These include, among others, increasing salinity, anaerobic germination, drought, and disease problems in submergence rice areas, particularly in the Ayeyarwaddy Region. 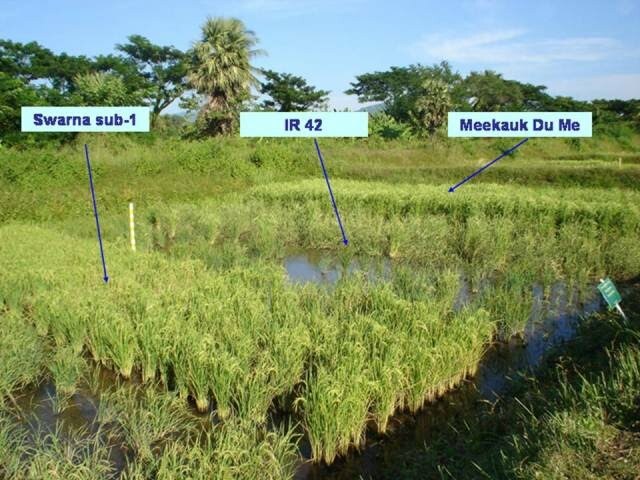 Researchers and farmers will have to work hand-in-hand to develop and validate submergence-tolerant rice varieties that are, at the same time, tolerant of other stresses. This would be the next pathway for rice research in Myanmar as it tackles ways and means to increase farmers’ incomes in flood-prone areas.